Drake Maverick narrates, talking about Hideo Itami’s victory over Cedric Alexander last week. He also talks about tonight’s match between Lio Rush and Lince Dorado. Last, Maverick announces that Buddy Murphy will compete in the non-title open challenge he issued last week. Lio Rush heads to the ring and welcomes everyone to “Lio 5 Live.” He also says he has some unfinished business with Lince Dorado. 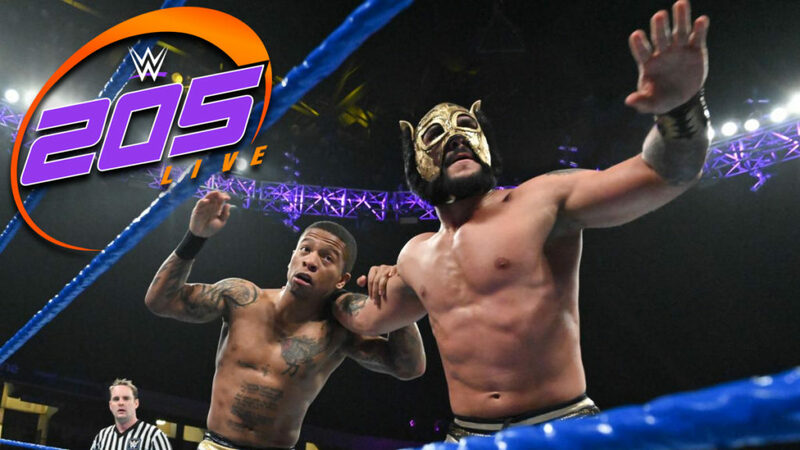 Rush came to 205 Live to win, and Dorado ruined Rush’s chance to compete for the Cruiserweight Title. Tonight, Dorado will feel the rush. Lucha House Party heads down to the ring, but Rush isn’t happy. Rush tells Dorado that he can’t beat him without Lucha House Party at ringside. Kalisto and Gran Metalik head to the back, and Rush takes the opportunity to attack Dorado. Very good match. There was, of course, a lot of speed in this match, but both guys were fighting to hurt each other as well. Rush approached the match more arrogantly, but he had to get more serious as Dorado brought the fight to him. This was well done, and I think they make a good match. After the match, Lio Rush attacks Dorado as he starts to walk up the ramp. Kalisto and Gran Metalik quickly run out, and Rush runs away through the crowd. Dorado can be seen holding his leg as the segment ends. Kayla Braxton welcomes Noam Dar. Dar begins to talk about how he proved something when he beat Nese last week, but Tony Nese walks up and interrupts him. Nese says the only thing Dar proved was that he got lucky. Nese challenges Dar to another match so he can prove Dar’s win was a fluke. Dar seems okay with that, but he also reminds Nese that he lost. Drake Maverick welcomes TJP. Maverick tells TJP that Buddy Murphy’s challenge has already been accepted, but Maverick likes that TJP has taken the initiative. TJP doesn’t say anything. Maverick says that if any more opportunities arise, TJP will be the first to know. TJP just laughs and walks away before Maverick can finish. Buddy Murphy walks towards the ring area. Kalisto says he has dedicated his life to be the best, so he will walk out of the Rumble as Cruiserweight champ. Brian Kendrick says he is teaching Akira Tozawa every dirty trick in the book for the title match on Sunday. Tozawa smiles. Ariya Daivari says Hideo Itami is hungrier for the title than any of his opponents on Sunday. Itami nods. Good match. I like Carillo. Even though it makes me a little sad that this means his team with Raul Mendoza is probably over, I think Carillo can do well on 205 Live. This match was good, though Carillo maybe got a bit more on Murphy than I would’ve liked. Regardless, it was fun to watch, and it did make Murphy look like a jerk. So, yeah, the match worked. This was a good show. I think the previous two weeks were hard to top, and this didn’t top those, but it was still very enjoyable. An average 205 Live is still a very good show. The main event was fun, but the Rush/Dorado match was better. It had more emotion, more unpredictability, and it was more evenly fought.